While automation has significantly reduced the incidence of water and sewer bills that are based on estimated consumption, the number of customers who disputed water and sewer bills and/or requested to have meters checked for accuracy has remained fairly stable. Automated meter readings accounted for 96% of bills in the first six months of 2012; manual readings accounted for 3% and estimated and forced reads were 1%, down from 10% in 2008 and 2009. Automated reads should improve billing accuracy, but between 9% and 18% of accounts had at least one disputed bill or customer-initiated meter investigation each year between 2007 and 2011. 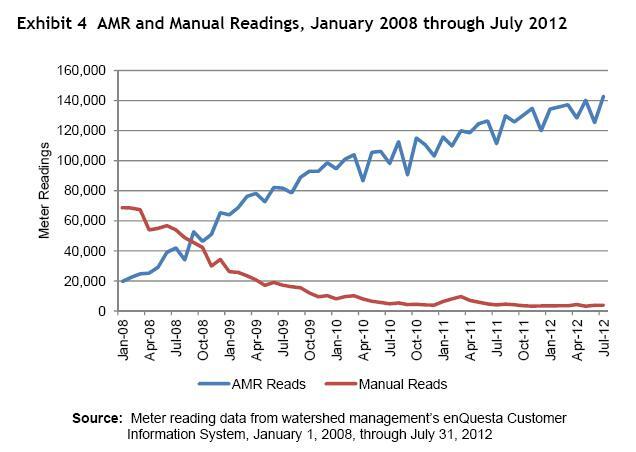 The majority of the readings were automated meter readings in the first six months of 2012; as a result, manual and estimated readings have significantly decreased. Although the increase in automated readings should improve bill accuracy, the department cannot track the number of adjustments made because of leaks or billing errors. Undetected leaks appear to explain many of the unusually high bills that have led to customer dissatisfaction. Under the department’s existing technology and processes, many customers will not know they have a leak until they have received at least one high bill. We made several recommendations to improve customer communication about meter investigations and unusually high bills. The Department of Watershed Management’s small meter evaluation found that only one-third of meters met all standards. The department's internal findings are similar to those in our 2007 audit of the automated meter reading program. We reiterate a key recommendation from that audit to complete implementation of a small meter maintenance plan.